Have you ever looked up into the sky? If you ever see a blinking white dot moving among the stars, chances are you are seeing a comet. I can’t promise that you might be seeing a comet, they are rare. But I’m going to tell you about two comets — Halley’s Comet and Comet Holmes — 17P Holmes to be precise. Let’s start with Halley’s Comet. Halley’s Comet is only seen every 76 years. Whew! I’ll be 61 when it comes by Earth again! Halley’s Comet is one of the most popular comets. You’re pretty much geared up on these two comets! See ya! 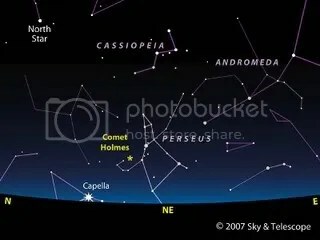 Tonight, November 17th, there will be a meteor shower, with a couple dozen meteors per hour. It is called the Leonid Meteor Shower. The best time to see it is midnight and later. Please look north for the best views. Please make sure that there are little or no lights in the area as lights make it harder to see the meteors. This has been a special bulletin from The Miles and His Favorites Discovery Newspaper. Hey Miles, I don’t know how I missed this one! When Halley’s comet last visited in 1986 I was lucky enough to be visiting with my Great Grandmother Wiseman. She got to see the comet *twice* in her lifetime– she was born in 1895 so she got to see it in 1910 and 1986. I don’t know if I’ll be fortunate enough to see it twice, but it was really special to listen to my Great Grandmother tell me about seeing the comet in 1910!